Review posted January 31, 2013. A Neal Porter Book, Roaring Brook Press, 2012. 36 pages. 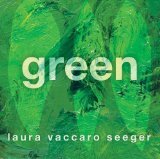 When I first read Green, I thought it was good, but didn't give it a lot of attention. It grew on me. The exquisite craftsmanship with so many details in exactly the right place deserved another look. The text is only two words per page, and the second word is always "green." We've got forest green, sea green, lime green, pea green, jungle green, khaki green, fern green, wacky green, and more. But there are imaginative, beautiful, and detailed paintings on each page, not the way you'd necessarily think those adverbs would go. And each page also has a die cut hole. The hole works in very different ways on both sides of the page, enhancing the picture both times. This isn't as much a book for sharing with a large group (though it would work that way) as it is for exploring one-on-one with a child. They will want to look at the pictures and at the way the die cuts work again and again. This book is a masterpiece of craftsmanship and a beautiful work of art. I'm so glad it won Caldecott Honor. This is one that's hard to describe with words. You need to check it out and look at it yourself. Then take another look. Better yet, let a child show you how fascinating it is.